Highly decorative early map of the Great Lakes showing fictional islands in Lake Superior. Gli Stati Uniti dell' America delineati sulle ultime Osservazioni. Primo Foglio che comprende inoltre Parte del Canada. A spectacular 1797 Giovanni Maria Cassini map of the Western Great Lakes and the surrounding regions. Centered on Lake Superior, the map covers from the Mississippi River to the eastern limits of Lake Huron and from an apocryphal lake, Cristinesi, to the central part of Lake Michigan, roughly in the vicinity of modern day Milwaukee. The Post-Revolutionary War borders of the United States and Canada are noted. Being a somewhat large scale production, the map offers excellent information, including the deportment of American Indian tribes and villages. A highly decorative title cartouche appears in the upper left quadrant and features fishermen. The four fictional islands in Lake Superior are present. Laid down by Jacques-Nicholas Bellin in his influential 1744 map, these apocryphal islands include: Philippeux, Pontchartrain, Maurepas, and St. Anne. They were invented three years earlier by the French historian and traveler Charlevoix, then subsequently immortalized by his cartographer Jacques-Nicholas Bellin. The islands were intended to honor Charlevoix' s personal patron, the Count of Maurepas, Jean-Frederic Phelypeaux. The largest of the three islands, Philippeaux, is named directly after the count. The second largest island, Pontchartrain, refers to Phelypeaux's family estate. The third island, which may in fact be a mismapping of the factual State Islands, is named after the count's seat, Maurepas. The fourth and smallest of the islands, St. Anne, references the count's patron saint. Charlevoix described the islands as being rich in minerals leading numerous explorers to search for them in vain. 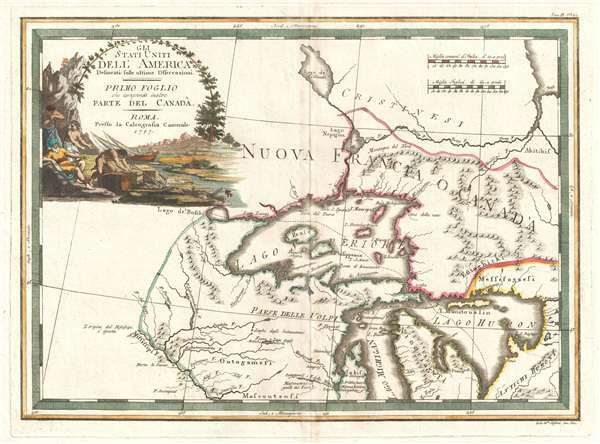 Bellin dutifully introduced the four islands to his map, and such was his influence that they were subsequently copied by most subsequent cartographers, including John Mitchell in his seminal 1755 wall map of North America. The highly regarded Mitchell map was used in negotiating the 1783 Treaty of Paris that formally concluded the American Revolutionary War. Therein, the apocryphal Philippeaux was assigned as a marker for the new United States - British America border thus setting the stage for later political strife. Cartographically Cassini derived this map from the 1778 Zatta 12 sheet revision and expansions of the John Mitchell's seminal 1755 map of the eastern part of North America. Cassini published six maps of United States regions based upon Zatta's work, of which this is map no. 1. This work was published in Cassini's 1797 Nuovo Atlante Geografico Universale. Today all maps from this series are highly sought after for their exceptional beauty and fine engraving. OCLC 944184424. McCorkle, B. B, New England in Early Printed Maps 1513 - 1800, 797.3.